Getting some compile error with mlv_rec and mlv_snd in crop_rec_4k branch. Don´t have my camera to test but I follow the error and change the line in mlv_rec to below which seems to get rid of the error code for both mlv_snd and mlv_rec. Well I guess the original 4K trolls are no longer trolls. But if 4K is possible that must mean 1000fps is as well. Respect to a1ex and the whole magiclantern team. No more excuses for not producing world class imagery. That reminds me, I should do a pull request for the 700D but it looks like there's more work to do now. How about getting some other cameras up to speed on the crop_rec module? By the way, don't expect 4k on anything other than the 5D3--then again maybe there will be more surprises. Yep - my point was that people outside the core team are definitely able to play with this code (as in, it's not pure black magic). Next annoyance was the grayscale preview, which is slow and not working at all in 10-bit. Also, lossless MLVs are not playable in mlv_play. Will look into those. These are just approximate calculations. You can initially estimate the speed of the sensor. Of course we must remember about the speed of writing. My point too. I'd like to get some more people to start playing with the code. There's lots of information in the comments and on the forum that takes the mystery out of what's going on--though some of what you're doing sure seems like pure black magic. 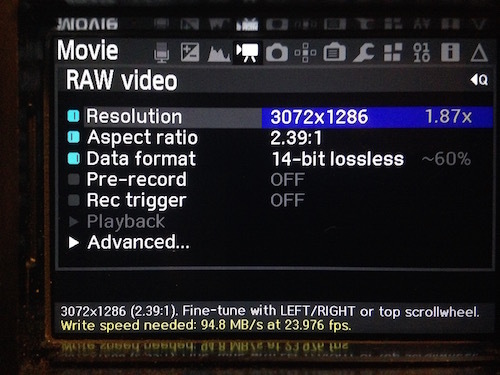 and the rather slow 5D2: 21.2MPx x 3.9fps = 82.68MPx/s. Does this basically tell us the limit of the sensor? 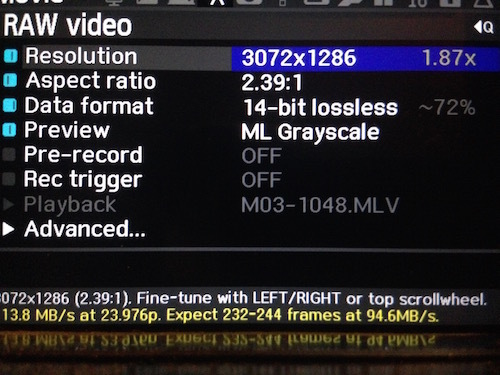 So this calculation works: 82.68/23.976 = 3.45MPx limit at 24p on this camera? So I guess it could do 2560x1320(3.38MPx). how does one implement the "Greg's resolution hack" that I've been hearing about? One Q about * 1920x960 @ 50p (both 1:1 crop and full-frame - 3x3 pixel binning). 1920x960 @ 50p (3x3 pixel binning) works good, but i can not set 1920x960 @ 50p for 1:1 crop, only 1920X632. 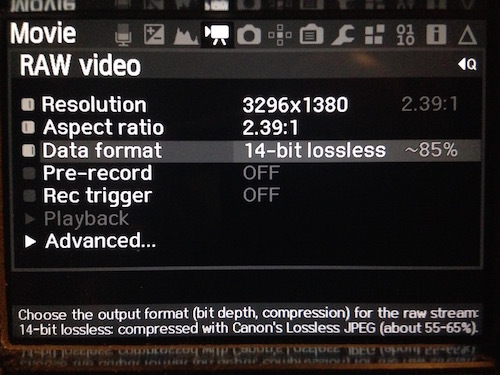 I set Crop mode - 1920 1:1 and 50p in Canon menu. Updated the preview with something a little more usable. 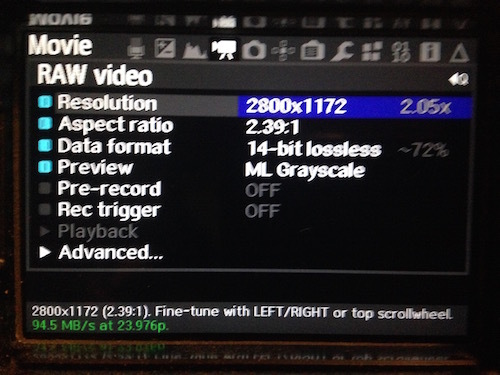 It's color (though still low-res and non-realtime) and only drops to grayscale when recording speed becomes critical. 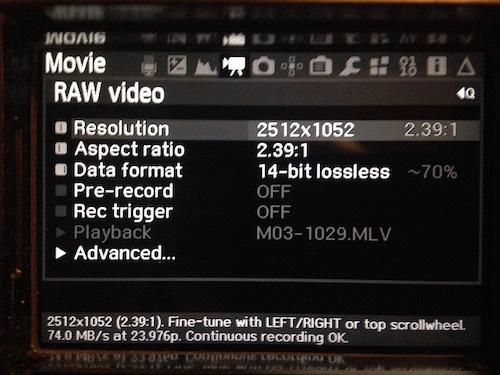 I can probably get faster previews in 14-bit lossless mode, by configuring the source raw stream as 16-bit (unpacked), since the compression routine accepts 10/12/14/16-bit input. For uncompressed modes, I'm afraid we currently don't have a way to get both unpacked data (for fast previews) and bit-packed (for recording) while in LiveView (so all my previous ideas are currently fiction). New build posted on the Experiments page. Trying to see what the next step is to see if there are any modes 700d can get, first i messed with atdg tool to try to reproduce the 3x3bin mode while in 720p by changing 0x4 to 0x2 on 800c just to understand how the tool works since those values are posted. I then set the tool to show values that have been changed more then twice and screen captured every value for 1080p, 1080p x5 and x10, 720p, 720p x5 and x10, crop mode in 1080p and also photo mode just to track all the values that are changing in case it was needed. Thats where i am at now though, not sure what values to change though, gets scary when you see the crazy images on live view that make u think u burned sensor out. Only thing i saw that did anything as far as the size was 800c changing to 0x0 makes a zoomed version but its stretched tall. Other then that another one moved the image up and down. Dont know how to cross reference with the 5d3 cause i see Pack12(?,?) for example and the values are not like what you see in the tool. So pretty much clueless on where to go from here?? Wow! That's a hell of a lot more useable and the preview is centered which is absolutely kickass. I get 30 frames in UHD, but 3K is still continuous for me in crop_rec. The preview does drop back to greyscale about 50% of the time in 3K. The colour preview is more detailed and has a higher refresh rate... it's pretty much usable, I think. Ideally the compression ratio would either be fixed, or manually adjustable. That's mathematically impossible, and not how lossless compression works. The compression ratio you get is totally dependent on the scene, and it's even theoretically possible that the compression results in larger file sizes than the original uncompressed data. This typically happens when you give a lossless compression algorithm data that has very little redundancy (already compressed), or that is not of a type the algorithm is "tuned" for, for example feeding the compressor 10-bit raw data results in the compressed version actually being larger. For the most part, lossless compression algorithms work by simply eliminating redundant data via more efficient encoding. Take some text for example, encoded using ASCII, each character takes 1 byte to store and therefore all characters have equal weight even ones that are rarely used. However we know that in any particular language there are characters (or even sequences of characters) that typically appear more often than others, so if we gave the characters that appear more frequently, shorter encodings (which subsequently requires less common characters to have longer encodings), then overall we can save space. However if we were to feed random gibberish to such an algorithm, it might actually take more total space the store than the original simple encoding, since the characters with longer encodings are just as likely to appear as ones with shorter encodings. Understood, but from a cinematography perspective; I need to figure out what resolution will give the card enough headroom to write at that resolution continuously at least 90-95% of the time; so far it looks like that's somewhere in the 2.5-2.6K range for 24p 2.39:1, which is still great. 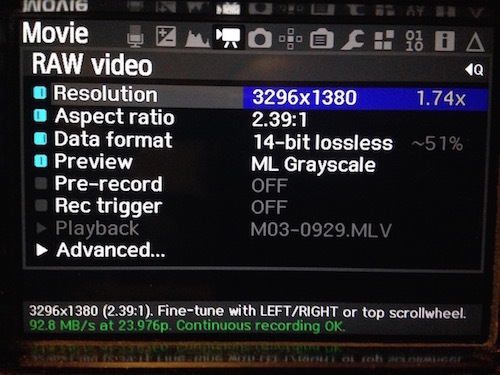 2.7-2.8K 2.39:1 looks like the sweet spot for repeatable continuous recording on the Toshiba 1066x card. By "repeatable" I mean repeatable near 100% of the time. Same goes for 3.3K anamorphic scope: 2272x1364 with a 1.5x anamorphic lens. DAMN ! This update is very promising. I did some tests and yes it's more comfy for framing. Thanks you for all these exciting features A1ex and all the team. OK, I'm pretty sure that the 14bit lossless compression varies with ISO. But if I whack the ISO up to 6400 I only get eleven seconds.